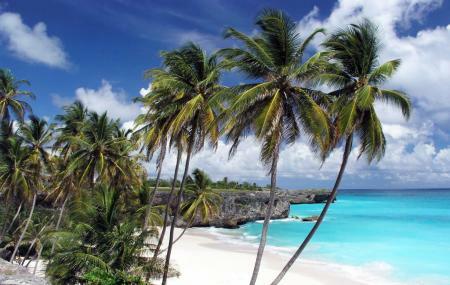 Concealed by the crane beach and Sam Lord’s castle, Bottom Bay is a piece of elegance partially enclosed by high coral cliffs, surrounded by tall palm trees offing magnificent views of the south shore. The beach with its warm soothing water kissing the shore through gentle waves is pure temptation for scuba divers and snorkelers. But beware; these gentle looking waves carry a strong current within making the water unadvisable to swim in. Plan a lovely family picnic or a lazy day out at this beach. It sure wouldn’t disappoint you. If you’re lucky you may spot turtles and whales. Swimming is not recommended at this beach due to strong currents. You can visit the neighboring beaches if you wish to swim, dive or snorkel. Do not litter on the beach. Help keep it clean. How popular is Bottom Bay? People normally also visit St Nicholas Abbey while planning their trip to Bottom Bay. Beautiful beach off the beaten path with a short walkway down to water. Absolute Paradise! So far on our trip, this is my favorite beach. Made cozy by being tucked in between a U shaped cliff face, this beach is magestic to behold. It is not as busy as some of the other beaches along the south coast of the island. A few locals tend the beach and you can rent beach chairs from them and buy refreshing coconut water from them as well. The waves were rough when we went, so be careful of the undertow after a stormy night. Perfect hideaway. Coconut tree's. White sand and even a cave. Tropical Paradise. Beware the aqua blue sea. Not for swimming.